Welcome to Dames a la Mode! Use the link at the top of the page to see what creations I have available, look at some beautiful fashion plates, or check out what I'm up to in my sewing world. What's new at Dames a la Mode? I've updated my "offerings" section with my newest Etsy listings. 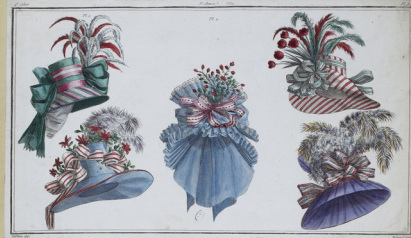 I've added a new section in the "research" area with images of bonnets from fashion plates by year. I only have 1797 and 1798 from Journal des Dames et des Modes at the moment, but I will add more soon. 7/20 - I've added new bonnets (and hats!) to the "custom made" section so that you can see some of my new creations. 3/12- I've created a new section to display some of the images I've found in my research on 18th Century bonnets. Click on the "bonnet research" tab to see them. I've added bonnets to my Etsy shop, finally! Please check the "offerings" tab to see what I have available. I've updated the images on the custom orders tab to see some of the bonnets I've made.